Bathrooms have become much more than just rooms that are necessary to fulfill a certain function in the home. Recently, bathrooms have come to be viewed as quiet, relaxing spaces that provide a tranquil retreat from the stress of everyday living. People value beauty and the feeling of luxury in the bathroom as much as in any room of the house. The quality of the bathroom furnishings can greatly contribute to the sense of calm and peacefulness that people desire to bring to their bathrooms and their homes. When considering bathroom furnishings, one automatically envisions fixtures such as sinks, toilets, and tubs or showers. Mirrors, cabinets, closets and countertops are also prominently featured in bathroom design. Floors, walls, space and accessories also need to be addressed. When deciding on finishes and furnishings for a bathroom, the function of the room must dictate many of the choices. An unusual, but innovative choice for bathroom furnishings are those made of wood. 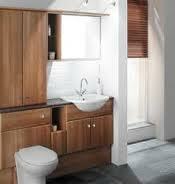 Wood is not a material that immediately comes to mind when deliberating about bathroom finishes. Traditionally, bathrooms conjure up images of tile, marble, porcelain, and glass. However, in keeping with the idea of luxury and unique style in the bathroom, wood is a material that can serve many purposes. The presence of wood brings a natural ambiance to the room. It adds to the feeling of relaxation, tranquility, and warmth. The color and texture of wood provides a sense of connection with the outdoors and also with the rest of the house. Depending on the choice of wood and the finish, it can bring a traditional or modern feel to the bathroom. Hardwoods such as oak or pine coated with a protective finish are recommended. The type of wood used in bathroom furnishings should be chosen carefully to accommodate for the amount of moisture typically present in a bathroom. Bathroom furnishings made of wood include, but are not limited to, cabinets, closets, moldings, counters, floors, and accessories. Wooden bathroom furnishings may be somewhat more expensive than traditional materials. The price is higher because of the craftsmanship that is involved in using wood to create traditional bathroom furnishings. Another concern is the impact on the environment of the use of a great deal of wood for furniture and flooring. However, there are ways to incorporate wooden furnishings into a “green” space and also save money. If wood furnishings are used along with other, more traditional materials, you can strike the perfect balance between beauty, budget, and caring for the environment. Wood furnishings in the bathroom can help create a beautiful and unique personal space.